Unsigned Only Music Competition is taking entries for its "Video Only" special promotion, running March 20-29. This is your opportunity to enter a music video into Unsigned Only for the first time this year! Original music and cover songs are eligible, and all credit will go to the performing artist(s). Note: If you don’t want to enter the "Video Only" promotion, you can still enter your music into any of the Unsigned Only categories without entering the "Video Only" promo. This is an opportunity to show your creative side by putting your video making and promotional skills to the test, whether it be a fully produced video or a homemade video, that you shoot on your iPhone or video camera. You don’t have to worry about being a professional, because two videos will become winners, one that is a fully produced video and one that is a homemade video. The two winners will be awarded some cool prizes, including a one year license to Filmora9 and a GoPro. Plus, all entries will be entered into the overall 2019 Unsigned Only Music Competition, and eligible for all competition prizes. And to top it off, all "Video Only" entrants will receive a free 30-day trial of Filmora9, a leading video editing software program that will make your future music video editing as easy as ever. It’s very simple to participate. Just make your video (or choose one you've already created) and upload it to YouTube, Vimeo, Facebook, your website, or any other platform where we can go and view it. When entering your video, you'll choose whether it's professional or homemade, provide a streaming link, choose your category, and then proceed to check out just like entering your songs! CAN I STILL ENTER MY MUSIC WITHOUT A MUSIC VIDEO? Yes, you can opt-out of the "Video Only" special promotion by selecting neither at the top of the entry form and enter your music into any of the Unsigned Only categories available for entry without entering the "Video Only" promo. Entries Are Open – enter now! Unsigned Only is accepting entries. Click here to enter. The Extended Deadline ends at 11:59 PM on April 30 (CST). In honor of the Valentine's Day holiday, Unsigned Only is running a two-week special promotion called "Win Some Love." 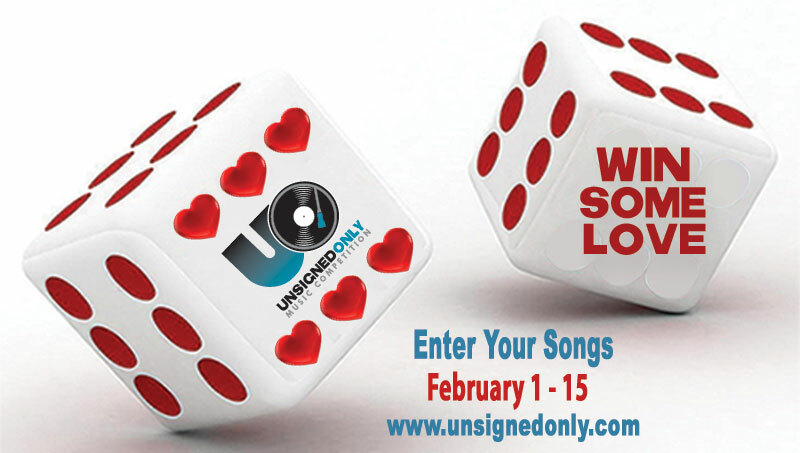 All songs entered between February 14 - 28 will automatically qualify for the promotion and be eligible for special prizes, as well as be entered into the overall 2019 Unsigned Only Music Competition. Additionally, everyone that enters the two-week promotion will get one free song review from Drooble.com and 100 free spins just for registering a new account on Radio Airplay. This is our chance to give some love back to you! Enter as many songs as you like in as many categories as you like! A First, Second, and Third Place winner will be selected in this special promotion and chosen by Unsigned Only. Please note: songs entered do not need to be about love! Prizes for "Win Some Love" include merchandise and services from Radio Airplay, Shubb Capos, Merchly, Celebrity Access, Indie Bible, CAD Audio, Gauge Microphones, Pure Grain Audio, Symphonic Distribution, Graph Tech Guitar Labs, and more. Click here for a full prize listing of both the overall competition prizes and the "Win Some Love" prizes. Unsigned Only has extended the deadline to April 30, 2019, at $35 per entry. Click here to enter. Click here to view the complete list of all winners. Congratulations to all winners, and a thank you to everyone who entered this year! This Way North (Melbourne, VIC, Australia) – "Head Above Water"
Unsigned Only is pleased to announce the finalists! Click here to view the complete list of finalists. Click here to view all prizes. Congratulations to all UO finalists! A First, Second, and Third Place winner will be selected in this special promotion. Three winners will be selected and given free access ($1000 value each) to "The Art Of The Song Pitch," a step-by-step online course by Sync Songwriter that shows you how to license your music successfully. One overall winner will receive one free album distribution online and one free video distribution, courtesy of Symphonic Distribution. Everyone who entered this promotion will have their initial Symphonic Distribution setup fee waived. One overall winner will receive a promotional package that will give exposure to the winner. All of these finalists' songs will be made available online to a group of over 1,000 publishers. One overall winner will also get to directly speak to and network with at least five publishers from music publishing companies. Ezra Vancil (USA) – "Complicated Man"
One lucky winner will win $1,000 (US) in cash. Additionally, the winner will receive a 500 CD Duplication package from Disc Makers. To view the complete list, click here. Congratulations to all semi-finalists, and thank-you to everyone who entered. We are humbled by the iincredible amount of talent! All finalists (including those in the special promotions) will be announced by the end of July. Winners will be announced in early September or as soon as the judging is completed. UNSIGNED ONLY 2018 is reopening entries for a special promotion, so if you missed the deadline and still want to enter, or if you want to enter more songs, you still have a chance to participate in this year's competition. WHAT IS GRAND SLAM? The GRAND SLAM promotion runs from May 8th to June 6, 2018. Each week will offer a different promotion and bring unique opportunities and benefits to entrants. You can enter online or through the mail. You are welcome to enter any of these promotions or all of them. Winners for these four promotions will be announced along with all of the other category winners in September, 2018. All entrants will receive 100 free spins to Radio Airplay (whether you are an existing Radio Airplay member or a new member) - just for entering! Additionally, every entrant will also be entered into the overall 2018 Unsigned Only competition and have the chance for their music to be heard by a high-profile panel of judges, as well as be eligible to share in over $150,000 in cash and prizes. You've got a great song or album, so now what do you do? If you want to easily sell it online via iTunes, Spotify, etc., then this promotion is made for you. Ten finalists will be chosen, and one overall winner will receive one free album distribution online and one free video distribution, courtesy of Symphonic Distribution. Everyone who enters this promotion will have their initial Symphonic Distribution setup fee waived. This promotion is for original music only. Every indie artist could use more exposure, and this promotion will help to achieve that goal. Ten finalists will be chosen, and one overall winner will receive a promotional package from Unsigned Only that will include an official press release distributed to thousands of press outlets, editorial coverage from our partners (BRASH Magazine, KC Cafe Radio, and MusicPlayer), and a quarter page advertisement in Music Connection Magazine focusing on the winner. Additionally, the promo package will consist of social media posts on Facebook, Twitter, Instagram, YouTube, and inclusion on Unsigned Only's Spotify playlist. This promotion accepts both cover songs and original music. We all know how important publishing is to an artist - it is one of the major sources of revenue, but it is extremely difficult to get your music heard by publishing companies. Unsigned Only is offering you the opportunity to have your songs heard by established, high-profile publishers. Ten finalists will be chosen, and their songs will be made available online to a group of over 1,000 publishers. One overall winner will also get to directly speak to and network with at least five publishers, all from well-known and respected music publishing companies. This promotion is for original music only. Click here to enter your songs. The Extended Deadline for Unsigned Only 2018 is quickly approaching on Friday, April 27, 2018. UO is looking for great artists to enter this year, as long as they aren't signed to a "Major" label, (indies are totally fine!). Enter your songs today here. Unsigned Only Music Competition is running a special two-week promotion, “Sync Me Up,” from March 20 to April 3, 2018. This promotion is for anyone interested in learning more about what you need to know in order to get your songs into TV & Film. Three winners will be selected and given FREE access ($1000 value each) to "The Art Of The Song Pitch," a step by step online course by Make Money From Your Music that shows you how to license your music successfully. It includes interviews from over 20 licensing experts giving you a peek behind the scenes to see how things really work. Even better, at the end of the course, you will be guaranteed the opportunity to pitch your music directly to a panel of top music supervisors, who work for organizations like Sony Television, Discovery Channel, STX Entertainment, Neophonic Music & Media, and more. This is a great opportunity to utilize the skills developed throughout the course and directly engage with real licensing professionals. Please note, only original songs can be considered for this special promotion. Additionally, all songs entered into this special promotion will also be entered into the 2018 Unsigned Only Music Competition and will be eligible for the overall competition prizes. Enter as many songs as you like in as many categories as you like! The winners will be selected by Unsigned Only and announced with all the other winners in September, 2018. If you want to improve your chances of engaging with sync professionals, you should also check out our Screen Shot category (original songs in all genres suited for placement in Film/TV/Advertising/Gaming). All finalists in this category will be shared with over 1,000 music sync professionals, and one overall winner will get direct mentorship from licensing professionals, which have included Disney, Lionsgate, Lyric House, Level Two Music, EA Sports, and more. In honor of the upcoming Valentine's Day holiday, Unsigned Only is running a special two-week promotion, "Win Some Love," from February 14-28, 2018. This is our chance to give some love back to you and give you the chance to win some great prizes (valued at $10,000) – plus all entries will be automatically entered into the 2018 Unsigned Only Music Competition and will be eligible for the overall competition prizes. Enter as many songs as you like in as many categories as you like! A First, Second, and Third Place winner will be selected in this special promotion, and winners will be selected by Unsigned Only. Prizes for Win Some Love include merchandise and services from Shure, Vinylify, Supreme Tracks, Celebrity Access, D'Addario, Disc Makers, Indie Bible, Radio Airplay, and Symphonic Distribution. Click here for a full prize listing of both the overall competition prizes and the Win Some Love prizes. Unsigned Only has extended the deadline to April 27, 2018 at $35 per entry. Click here to enter. Just a friendly reminder that the Regular Deadline for UO 2018 is quickly approaching. Enter your songs on or before Jan24th here. Unsigned Only has announced it's offical judge panel for 2018. Click here for more details. Unsigned Only's 2018 Early Bird Deadline is right around the corner. Enter your songs on or before October 4th at $25 per entry. Click here to enter your songs. Click here to view the complete list of all winners, including all special promotions. Congratulations to all winners, and a thank you to everyone who entered this year! Check back in a few days for the announcement of 2017 winners. Unsigned Only has officially opened Fandemonium 2017! This is your chance to vote for your favorite finalists' song. The song with the most public votes will be the 2017 Fandemonium winner, which is in addition to, and separate from, the regular winners selected by UO’s judge panel. The winner will receive a lot of great prizes from our sponsors including Radio Airplay, Disc Makers, D’Addario, Symphonic Distribution, and more! Winners will be announced along with all UO winners in September. You may only vote once per day. Unsigned Only is pleased to announce the finalists! Click here to view the complete list. Winners in Triple Play will be announced when the regular winners are announced. Winners in the Win Some Love promotion will also be announced at that time. To view the complete list, click here. Congratulations to all semi-finalists, and thanks to everyone who entered! Finalists (including those in Win Some Love and Triple Play) will be announced on or before August 1. Winners will be announced in early September or as soon as the judging is completed. For the first time ever, Unsigned Only is re-opening entries for a discounted entry fee of $25 per entry. Ten finalists will be chosen and one overall winner will be gifted $1000 in cash USD. Additionally, this is the LAST chance to enter the overall 2017 Unsigned Only competition and have the chance for your music to be heard by a high-profile panel of judges, as well as be eligible to share in over $150,000 in cash and prizes. Unsigned Only 2017 is reopening entries for three very special promotions, so if you missed the deadline and still want to enter, or if you want to enter more songs, you still have a chance to participate in this year's Unsigned Only Music Competition. The Triple Play promotion runs from May 8th - 29th, 2017. Each week will offer a different promotion and bring unique opportunities and benefits to entrants. You can enter online or through the mail. All entrants will receive 100 free spins to Radio Airplay (whether you are an existing Radio Airplay member or a new member) - just for entering! You are welcome to enter any of these promotions or all of them. Winners for these three promotions will be announced along will all of the other category winners. You've got a great song or album, so now what do you do? If you want to easily sell it online via iTunes, Spotify, etc., then this promotion is made for you. Ten finalists will be chosen, and one overall winner will receive free online distribution (and more), courtesy of Symphonic Distribution. Everyone who enters this promotion will have their initial Symphonic Distribution setup fee waived. Additionally, every entrant will also be entered into the overall 2017 Unsigned Only competition and have the chance for their music to be heard by a high-profile panel of judges, as well as be eligible to share in over $150,000 in cash and prizes. This promotion is for original music only. Every artist could use more exposure, and this promotion will help to achieve that goal. Ten finalists will be chosen, and one overall winner will receive a social media promotional package from Unsigned Only that will include featured social media posts on Facebook, Twitter, Instagram, YouTube, and inclusion on Unsigned Only's Spotify playlist. Additionally, every entrant will also be entered into the overall 2017 Unsigned Only competition and have the chance for their music to be heard by a high-profile panel of judges, as well as be eligible to share in over $150,000 in cash and prizes. This promotion accepts both cover and original music accepted. We all know how important publishing is to an artist - it is one of the major sources of revenue, but it is so difficult to get your music heard by publishing companies. Unsigned Only is offering you the opportunity to have your songs heard by established, high-profile publishers. Ten finalists will be chosen, and their songs will be made available online to a group of over 1,000 publishers. One overall winner will also get to directly speak to and network with at least five publishers, all from well-known and respected music publishing companies. This promotion is for original music only. Additionally, every entrant will also be entered into the overall 2017 Unsigned Only competition and have the chance for their music to be heard by a high-profile panel of judges, as well as be eligible to share in over $150,000 in cash and prizes. This promotion is for original music only. In honor of the upcoming Valentine's Day holiday, Unsigned Only is running a special two-week promotion, "Win Some Love," from February 1-15, 2017. This is our chance to give some love back to you and give you the chance to win some great prizes (valued at $6,500) – plus all entries will be automatically entered into the 2017 Unsigned Only Music Competition and will be eligible for the overall competition prizes. Enter as many songs as you like in as many categories as you like! A First, Second, and Third Place winner will be selected in this special promotion, and winners will be selected by Unsigned Only. Prizes for Win Some Love include merchandise and services from Billboard, Celebrity Access, D'Addario, Disc Makers, LANDR, Merch Cat, Music Business Registry, Radio Airplay, and Symphonic Distribution. For the first time ever, Unsigned Only Music Competition is offering a special promotion that offers free entries. Enter two songs, and get a third entry for free. Enter four songs, and get two additional free entries. Keep entering more songs, and get a free entry for every two entries you submit. This is your chance to affordably enter many songs and show Unsigned Only the depth of your talent and who you are as an artist. This promotion lasts only until January 20, 2017, so enter your songs now by clicking here. All entrants receive a free magazine subscription to either Guitar Player or Guitar World ($30 value) just for entering! Enter here. UO 2017 has entered its Extended Deadline period that runs through April 28, 2017 for $35 per song entry. Click here to enter. Unsigned Only is pleased to announce the 2016 winners! Click here for the complete list. Unsigned Only is pleased to announce the 2016 finalists. Click here. Congratulations to all the finalists! All winners (including Triple Play and Win Some Love) will be announced in early September as soon as the judging process is completed. Unsigned Only also has announced the finalists for Triple Play. Abby Lane (Nashville, TN, USA) - "The Middle"
Bian (Rio de Janeiro, Brazil) - "Hands"
David Myles (Halifax, NS, Canada) - "Learning To Love"
Eamonn Watt / The Virtual Conductor (Sandwick, Shetland Isles, Scotland) - "The Tale Of Buckaroo Bill"
Martin Zvara (Poprad, Slovakia) "Ti Apro La Porta"
Mo Kenney (Halifax, NS, Canada) - "Take Me Outside"
Papi Joe (Altona, Rock City, US Virgin Islands) - "Pop Style"
Port Cities (Halifax, NS, Canada) - "Back To The Bottom"
The Mother (Singapore) - "Lush"
Yoron Israel (Chicago, IL, USA) "Picket Fences"
To view the complete list, click here. Congratulations to all semi-finalists and a big thank-you to everyone who entered! We are humbled by the immense amount of talent! All finalists (including those in the Triple Play promotion) will be announced by the end of July. Winners will be announced in early September or as soon as the judging is completed. For the first time ever, Unsigned Only will open entries to ANY genre of music. You name it, we will accept it. 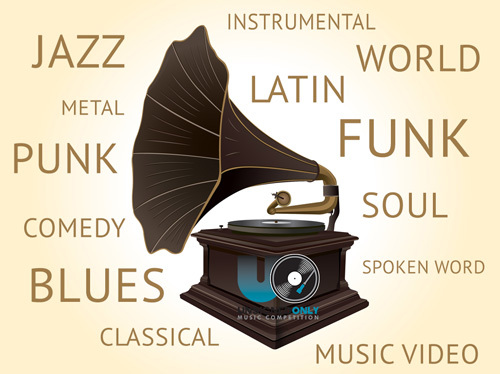 That includes Jazz, Latin, Music Video, Soul, Blues, Instrumental, Funk, Comedy, World, Children’s Music, Spoken Word, Metal, Classical, etc., as well as any kind of music that fits into our regular 2016 categories. Ten finalists will be chosen and one overall winner will receive $1,000 in cash (US), as well as a social media promotional package to help spread more awareness. Cover songs are accepted in the GET PAID promotion. Please note: Songs entered into GET PAID will NOT be entered into the overall 2016 Unsigned Only music competition. This is a stand alone special promotion. GET PAID is the only music category available. Clock here to enter. You may enter as many songs as you like. You've got a great song or album, so now what do you do? If you want to easily sell it online via iTunes, Spotify, etc., then this promotion is made for you. Ten finalists and one overall winner will be selected and will win free online distribution (and more), courtesy of Symphonic Distribution. Moreover, everyone who enters this promotion will have an initial Symphonic Distribution setup fee waived. If you would like to re-enter a song you have already submitted, you will need to choose a different category than the one you previously entered. Additionally, every entrant will also be entered into the overall 2016 Unsigned Only competition and have the chance for their music to be heard by a high-profile panel of judges. We all know how important publishing is to an artist - it is one of the major sources of revenue, but it is so difficult to get your music heard by publishing companies. Unsigned Only is offering you the opportunity to have your songs heard by established, high-profile publishers. Ten finalists will be selected, and their songs will be made available online to a group of over 1,000 publishers. One overall winner will also get to directly speak to and network with at least five publishers, all from well-known respected music publishing companies. If you would like to re-enter a song you have already submitted you will need to choose a different category than the one you previously entered. Additionally, this will be the LAST opportunity to enter the overall 2016 Unsigned Only competition and have the chance for your music to be heard by a high-profile panel of judges. Click here for a full prize listing. UO 2016 has entered its Extended Deadline period that runs through April 29, 2016 for $35 per song entry. Click here to enter. Enter now. All entrants receive a free 12-issue Digital Subscription to either Guitar Player Magazine or Guitar World Magazine ($25 Value!). Note: Limit one 1 year (12 issue) subscription per person. To redeem your free subscription, please reference your official confirmation email for more details. As a token of appreciation for entering Unsigned Only 2016, New Bay Media and Unsigned Only would like to offer you a free 12-issue Digital Subscription to either Guitar Player Magazine or Guitar World Magazine ($25 Value!). Note: Limit one 1 year (12 issue) subscription per person. To redeem your free subscription, please reference your official confirmation email for more details. In honor of the upcoming Valentine's Day holiday, Unsigned Only is running a special two-week promotion called Win Some Love, from February 1-15, 2016. This is our chance to give some 'love' back to you. Enter any kind of song, not just love songs, and be eligible to share in almost $7,000 in prizes. All entries will also be automatically entered into the 2016 Unsigned Only Music Competition and will be eligible for the overall competition prizes as well. Enter as many songs as you like in as many categories as you like! A First, Second, and Third Place winner will be selected in this promotion. Win Some Love winners will be selected by Unsigned Only. These winners are completely separate from the overall Unsigned Only winners but will be announced at the same time. Prizes include merchandise and services from A&R Registry, Audiokite, CD Baby, Celebrity Access, D'Addario, Disc Makers, Intellitouch Tuner, LANDR, Radio Airplay, and Sony Creative Software. Click here to enter your songs today! Unsigned Only is proud to announce our 2015 winners. Click here to see a full listing. Abby Lane (Nashville, TN, USA) "Over You"
Anthony Mossburg (Columbus, OH, USA) “Whiskey & Wine"
Winners in the Triple Play promotion will be announced at the same time as the winners in the overall competition. Unsigned Only is proud to announce the 2015 semi-finalists. Click here or scroll to the bottom of the winners' page to view the complete list. Semi-finalists are alphabetized by artist name. Finalists will be selected from the group of semi-finalists and will be announced on or before July 24, 2015. Congratulations to all semi-finalists, and thanks to all who entered Unsigned Only this year! Entries are closed for the 2015 competition. We are currently in the process of listening to each and every entry and will be selecting and announcing semi-finalists soon. Thanks to all who entered! Unsigned Only is reopening entries exclusively for all Taxi members for one week (JUNE 4 - 10), so if you missed the deadline to the Triple Play Special Promotion Week 3 (Publishing Mentorship) and still want to enter, you still have a chance to participate. Additionally, every Taxi entrant will also be entered into the overall competition and have the chance for their music to be heard by a high-profile panel of judges. All entries must be original music for this extended promotion. This will be your last chance to enter Unsigned Only this year, so enter now and take advantage of this great opportunity. LAST DAY TO ENTER UNSIGNED ONLY'S TRIPLE PLAY PROMOTION! Click here to enter your songs now. This is your last chance to enter 2015 Unsigned Only! We saved our best promotion for last! Unsigned Only is offering you the opportunity to have your songs heard by established, high-profile publishers. Ten finalists will be selected, and their songs will be made available online to a group of over 1,000 publishers. One overall winner will also get to directly speak to and network with at least five publishers, all from well-known respected music publishing companies, including SONY/ATV, Atlas Music Publishing, Disney Music Group, BMG, and more. All entrants will also receive 100 free spins, per entry, to a Radio Airplay account (whether you are a new or existing Radio Airplay member). Here's your chance to submit a music video to Unsigned Only for the first time. You can enter a professionally produced video or even a video made on a Smart Phone or other device by sending us the link to a streaming site like YouTube or Vimeo (no video file uploads please). Have fun with this and send us your video of any original song. We can't wait to see what you send us! Finalists will have their videos placed on a Zuus.com channel, and one overall winner will have their video featured on Zuus' homepage, as well as win a GoPro HERO3, courtesy of Unsigned Only. All entrants will also receive 100 free spins, per entry, to your Radio Airplay account whether you are a new or existing Radio Airplay member. Click here for the complete list of prizes for Triple Play. Unsigned Only is reopening entries for three very special promotions, so if you missed the deadline and still want to enter, or if you want to enter more songs, you still have a chance to participate in this year's Unsigned Only Music Competition. Each week will offer a different promotion and bring unique opportunities and benefits to entrants. Additionally, every entrant will also be entered into the overall competition and have the chance for their music to be heard by a high-profile panel of judges (see below). All entries must be original music for these promotions. You are welcome to enter any of these promotions or all of them. If you would like to re-enter a song you have already submitted you will need to choose a different category (e.g., Screen Shot or Vocal Performance). This will be your last chance to enter Unsigned Only this year, so enter now and take advantage of these great opportunities. You've got a great song or album, so now what do you do? If you want to easily sell it online via iTunes, Spotify, etc., then this promotion is made for you. Ten finalists and one overall winner will be selected and will win free online distribution (and more), courtesy of Symphonic Distribution. Moreover, everyone who enters this promotion will have an initial Symphonic Distribution setup fee waived. Here's your chance to submit a video to Unsigned Only. You can enter a professionally produced video or even a video made on a Smart Phone or other device by sending us the link to a streaming site. Have fun with this and send us your video of any original song. We can't wait to see what you send us! Finalists will have their videos placed on a Zuus.com channel, and one overall winner will have their video featured on their homepage and also win a GoPro HERO3, courtesy of Unsigned Only. We all know how important publishing is to an artist - it is one of the major sources of revenue, but it is so difficult to get your music heard by publishing companies. Unsigned Only is offering you the opportunity to have your songs heard by established, high-profile publishers. Ten finalists will be selected, and their songs will be made available online to a group of over 1,000 publishers. One overall winner will also get to directly speak to and network with at least five publishers, all from well-known respected music publishing companies, including SONY/ATV, Atlas Music Publishing, Disney Music Group, BMG, and more. UO 2015 has entered its extended deadline period that runs through April 30th, 2015 for $35 per song entry. Click here to enter. Regular Deadline Approaching on March 18th! The March 18th, 2015 regular deadline for Unsigned Only 2015 is rapidly approaching. Take advantage now and enter your songs here. Best of luck and thanks for your continued support! Click here to enter. In honor of the upcoming Valentine's Day holiday, Unsigned Only is running a special two-week promotion. Enter your songs the first week, the second week, or both weeks and be eligible to share in over $5,000 in prizes. Entering both weeks will increase your chances of winning! All entries into the "Win Some Love" promotion will be also automatically entered into the 2015 Unsigned Only Music Competition. Three winners each week will be selected, and winners will be announced in July with the regular Unsigned Only finalists. Unsigned Only is now accepting entries. Click here. Unsigned Only is pleased to announce the 2014 winners. Click here to see the list. Screen Shot is a special promotion that was held from May 12-23 and is geared toward the placement of music in film, TV, advertising, and video games. It is completely separate from the regular finalists in Unsigned Only. The following finalists will have their songs made available to Unsigned Only's list of industry contacts who specialize in music supervision and song placement. One artist will be selected from these finalists as the Screen Shot winner. In addition to a cash prize of $1,000 courtesy of Radio Airplay and additional promotion, the winner will have the opportunity to network one-on-one with a minimum of five Screen Shot advisors. The advisors include: Alec Sharpe (Shine America); Ani Johnson (Monomyth Media); Chip Miller (Desert C.A.M. Studios, Inc., Winmill Films LLC); Cindy Badell-Slaughter (Heavy Hitters Music Group); David Weiss (The SongHunters); Evan Stein (Experience Music Group); Jamie Sparks (Kicksta Music Group); Jennifer Taunton (Level Two Music); Jessica Cole(Lyric House); Karyn Rachtman (Mind Your Music); Linnette Harrigan (Linnette Harrigan Media); Michelle Bayer (Shelly Bay Music); Michelle Silverman (Modern Planet); Pat Weaver (Discovery Network); Rebecca Rienks (E! Entertainment | NBCUniversal); Richard Kirstein (Resilient Music); James Michael Kempter II (JMKconnections); and Velma Barkwell (East End Music). Check out the link at the bottom of the WINNERS page for the complete list. Entries are closed for the 2014 competition. We are currently in the process of listening to each and every submission. Thanks to all who entered. We look forward to hearing your music! Enter your songs for the opportunity to have your songs considered for placement in film, TV, ads, and video games. All songs entered into "Screen Shot" will also be entered into the overall Unsigned Only 2014 competition. Songs must be original, no covers allowed. This will be your last chance to enter Unsigned Only for the 2014 competition. Click here to enter. The entry fee is only $25 for each song or category. Sponsored by Radio Airplay, "Screen Shot" will make a select group of finalists' songs available to almost 1,000 industry contacts who are looking for music for upcoming projects. Additionally, one overall winner will be selected and awarded $1,000 courtesy of Radio Airplay, plus 4,000 Radio Airplay credits, promotion on Radio Airplay's social media outlets such as Twitter and Facebook, and an artist spotlight feature in their blog and newsletter reaching over 200K members. All entrants will receive 100 free spins on Radio Airplay for each entry. The winner of “Screen Shot” will be announced in August, 2014. Most importantly, the overall winner will get the opportunity to directly network with a group of execs who specialize in music placement. They include: Alec Sharpe (Shine America); Ani Johnson (Monomyth Media); Chip Miller (Desert C.A.M. Studios, Inc., Winmill Films LLC); Cindy Badell-Slaughter (Heavy Hitters Music Group); David Weiss (The SongHunters); Evan Stein (Experience Music Group); Jamie Sparks (Kicksta Music Group); Jennifer Taunton (Level Two Music); Jessica Cole(Lyric House); Karyn Rachtman (Mind Your Music); Linnette Harrigan (Linnette Harrigan Media); Michelle Bayer (Shelly Bay Music); Michelle Silverman (Modern Planet); Pat Weaver (Discovery Network); Rebecca Rienks (E! Entertainment | NBCUniversal); Richard Kirstein (Resilient Music); James Michael Kempter II (JMKconnections); Velma Barkwell (East End Music); and more to be announced. Unsigned Only is now accepting entries until April 30, 2014. Click here to enter. Unsigned Only is now accepting entries. Click here to enter. Unsigned Only has announced the 2013 winners. Click here to view the list and hear the winning songs. Congratulations to all winners! Unsigned Only is pleased to announce the 2013 finalists. Click here to see the complete list. Congratulations to all finalists! Winners will be announced at the end of August, 2013. Unsigned Only will be announcing finalists on Wednesday, July 31. We will be contacting all entrants, so check your email for the news! Be sure to click on the arrow on the right to see the complete list. Congratulations to all Semi-Finalists! Entries are closed for the 2013 competition. We are currently in the process of listening to each and every entry and will be selecting and announcing semi-finalists soon. Thanks to all who entered! Unsigned Only T-Shirts are now ON SALE! Looking for a cool gift idea for your fellow musician friends? How about picking up a custom, ultra soft, vintage-looking Unsigned Only T-Shirt? Now ON SALE and 40% off our original price, now is the time to pick up one of these custom tees!